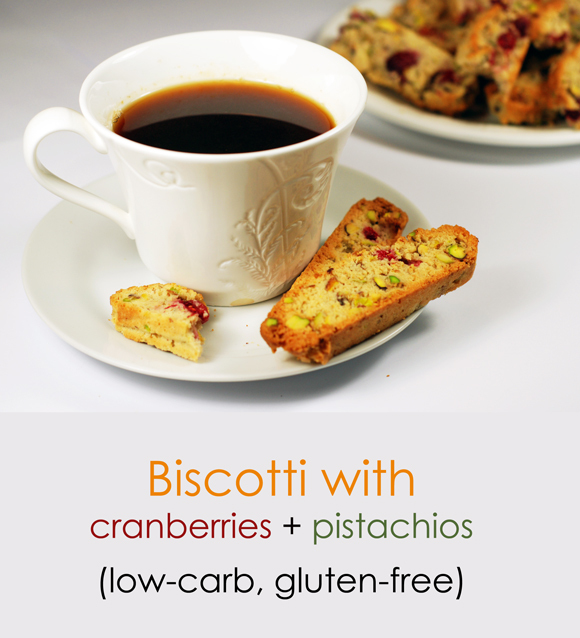 Biscotti are crunchy, twice-baked biscuits that are perfect for dunking. 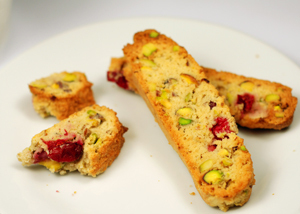 Our low-carb version uses almond flour as base, jazzed up with pistachios and cranberries. Is almond flour okay to use? Do I have to ground almonds? Hi Linda, they are pretty much the same thing (although some brands of almond flour are defatted – they are usually finer in texture). But you can use either one for this recipe. If I want to use Erythritol, how much would you recommend using in place of Truvia? I’ve heard it’s less sweet. Hi Victoria, you are right, pure erythritol is less sweet than erythritol/Stevia mixes. Start by adding about 50% more and taste the mixture, then add more if needed. Good luck! Thank you Henu 🙂 I am so glad you enjoyed them! I made these at Christmas and they were awesome! I was a bit challenged with the fist batch being a bit over cooked and coming out dark. I kept them anyway and put them in the freezer. the second batch came out beautifully,,,and were DELICIOUS. Once this batch was gone, we went to the frozen dark ones….they were just as good…just not as pretty. Thank you for creating this recipe! Thank you Nancy 🙂 So great to get positive comments about my recipes – it really makes my day! I am so glad you enjoyed them. And thanks for sharing the tip about the dark ones. These Biscottis are delicious but the net carb count is WAY off. The nutritional facts I got from this recipe is 7.29g carbs – 2.8g fiber = 4.49g net carbs. Did you use sweetened cranberries? Definitely not – sweetened versions have a LOT of sugar. I used frozen fresh berries – 100% cranberry with no additives whatsoever. They work fine in tandem with the sweetener in the recipe.